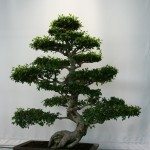 So I've been thinking... and I want to get an outdoor bonsai TREE. I live in New Hampshire and my zip is 03855. What should I get? Mind you when I say tree I mean tree!